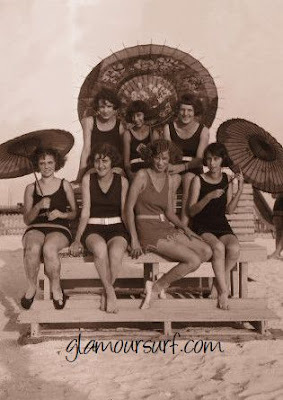 Parasols were once a fashionable beach accessory. Used to keep the sun out or to perhaps spin to gather the attention of a young man, they made a statement in beach fashion that is sorely lacking today. 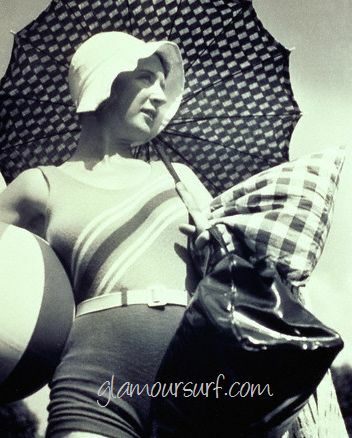 This young gal not only has her parasol, but a beach hat and ball along with a beach bag to carry her essentials. 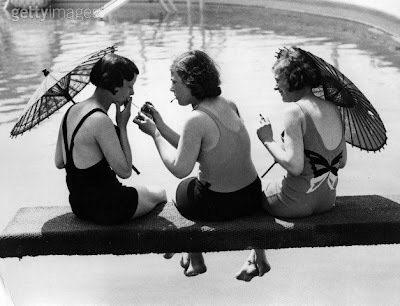 In the 1920s tanning the skin came into vogue as women sought to get the healthful effect of the sun on the skin. Do you carry a parasol to the beach? It definately makes a fashion statement as well as protecting your skin form too much sun. Recently Threads magazine put out an article on recovering your parasol or umbrella. I think it sounds like a fabulous project. You can find the directions here. Enjoy! Good blog,my dear! I think women with small babes do still take an umbrella to protect the young one. Along comes the wind, and watch out!! !